Spain’s new leader began harnessing the unlikely forces that brought him to power while a populist government took over in Italy, capping a week of political drama that sent financial markets into turmoil as the future of the euro region again rose to the fore. 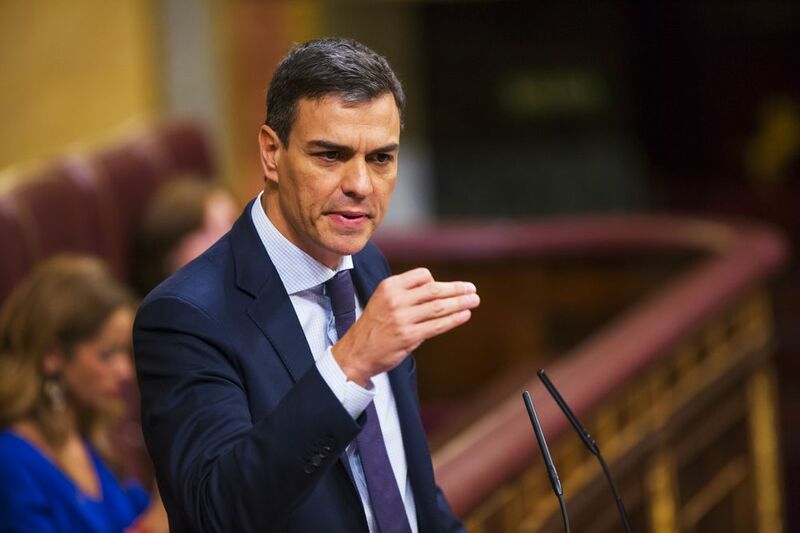 In Madrid, Socialist leader Pedro Sanchez was sworn in Saturday by King Felipe VI as the seventh prime minister of Spain’s democratic era after his appointment was published in the official gazette. He seized the opportunity to tap outrage over a corruption scandal involving the governing People Party to corral Catalan separatists and Basques into backing his no-confidence motion in Prime Minister Mariano Rajoy. Italy’s Five Star Movement and League parties took power in a spectacular reversal of political fortunes that brings an end to three months of deadlock. Giuseppe Conte, 53, a law professor with no political experience, was sworn in as prime minister along with his cabinet on Friday. The change at the top of the euro region’s third and fourth-biggest economies comes after markets went into freefall on the prospect of a possible resurgence of the crisis that gripped the single currency in recent years. While Spain is likely to stay pro-European Union, Italy’s new government threatens to further challenge the EU on budget rules and immigration, just as it’s under pressure from U.S. President Donald Trump on trade, the Iran nuclear deal and defense spending. The government in Rome was pieced together after weeks of Byzantine wheeler-dealing. Five Star’s Luigi Di Maio and the anti-immigrant League’s Matteo Salvini managed to mesh their populist programs only to pull the plug on a government at the last minute after the president vetoed their pick of a euroskeptic finance minister. Di Maio and Salvini will now serve as deputy premiers, with economist Giovanni Tria, 69, as finance minister. Euroskeptic economist Paolo Savona, 81, the rejected finance minister, will be responsible for European affairs. Italian bonds gained on Thursday after the news of the Five Star-League deal, with the 10-year yield falling about 18 basis points to 2.7 percent before rising again to 2.8 percent. It’s still up from 2 percent from two weeks ago. Markets, meanwhile, embraced Spain’s change of leadership. The benchmark IBEX 35 stock index rose Friday 1.8 percent and yields on Spain’s 10-year bonds fell. Sanchez’s next challenge — forming a government with only 84 deputies from his own party in a parliament of 350 — may be even harder than ousting Rajoy, a hitherto perennial survivor in Spanish politics. Sanchez is expected to announce at the start of next week who the members of his new government will be, El Confidencial report. He pledged to form a consensus, while Pablo Iglesias, the leader of the anti-austerity party Podemos, urged him to form a government with the forces that had backed him. Sanchez won the confidence motion on Friday by 180 votes to 169 with one abstention. Rajoy, who had conceded defeat before the vote took place, shook hands with his opponent, who was then embraced by his Socialist deputies beaming with delight at a political coup that looked impossible just a few days previously. But to win the support of the five Basque nationalists, Sanchez pledged to honor Rajoy’s budget that was passed in parliament just last week. That’s hard to stomach for Podemos and its allies, whose 71 lawmakers in parliament he will need if he’s to be able to govern. Keeping the Catalan separatists on board also looks like a tough ask. Sanchez backed Rajoy on his firm line in defense of the Spanish constitution which doesn’t permit regions to break away. Sanchez said there was an opportunity for a new understanding on Catalonia although he wanted the region to stay part of Spain. Posted by Above Whispers on June 2, 2018.